YOU considered it murder as early as fall 1999. After you spoke in Miami on October 16, 1999 and autographed my copy of "Nuremberg: The Last Battle", I recall asking: "the last battle -you think you've exhausted the subject?" 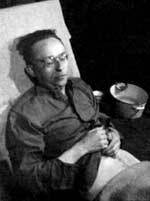 You replied: there was still plenty to be written, adding that you were writing on Himmler. Pedantically, I asked: "don't you think Peter Padfield had the final word?" You told me that an editor [Adam Sisman at Macmillan UK Ltd] had you review Padfield's manuscript; which you did, without credit. I asked if Gudrun [Himmler's daughter] would see you for an interview on her father. You stated there was likely little to learn from Gudrun, and the real story was the man's death -- which you were certain was murder! I scoffed, saying that unlike Hitler's death, Himmler was caught by the British, so there couldn't be a question of the truth. You were not so sure. I thought you'd climbed on Rosinante to think it worth your time to investigate Himmler's death. You were right. Long before May 2005.